On top of that, as they are made with oil and apple sauce, rather than with butter, they are suitable for anyone with lactose intolerance. These spiced tasty muffins can be served as a breakfast on the go, as part of a brunch buffet, or at any time you need a tasty and nutritious quick bite. Try them and enjoy. * A bit of Demerara sugar on top, creates a glistening, crunchy topping. However, if you can’t find it, you can omit it, or substitute with other types of coarse sugar. * Any other combination of dried fruits can be used instead of the ones mentioned here. 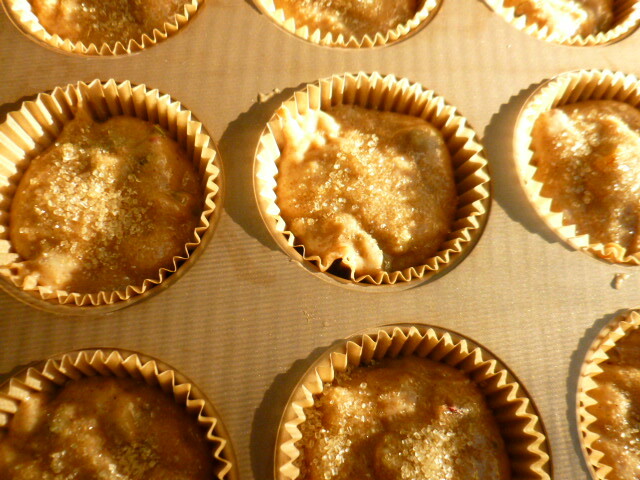 * For smaller muffins, the batter can be divided into 24 baking cups. In this case, decrease the baking time to 25 minutes. 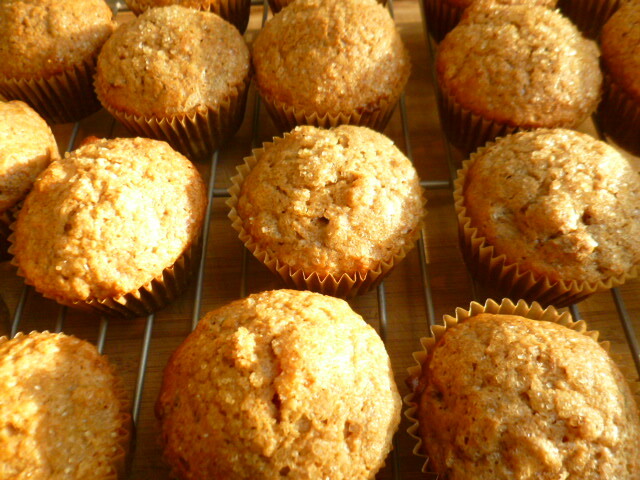 * The muffins freeze well and will keep, in freezer bags, for up to two months. 1. Preheat the oven to 355F (180C). Line two muffin pans with paper baking cups. 2. 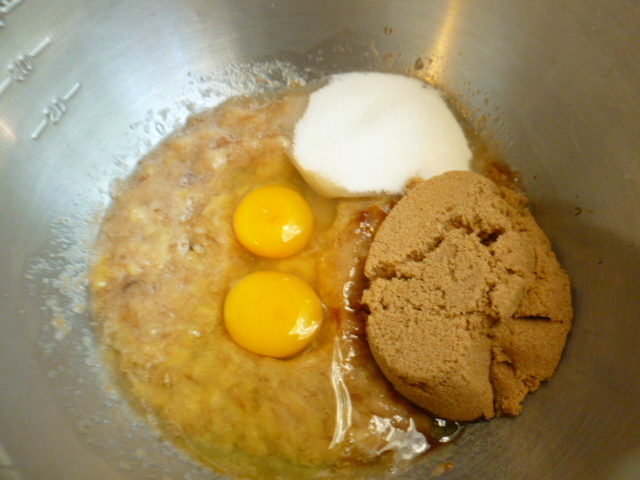 In a large bowl, whisk together the mashed bananas, eggs, brown and white sugar. 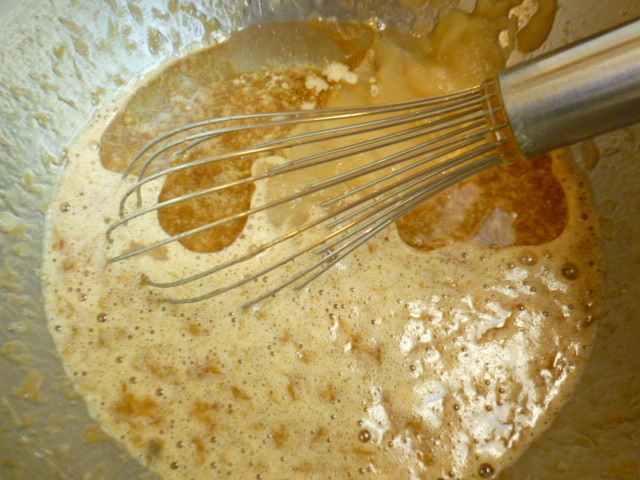 Add the oil and applesauce and whisk again. 3. 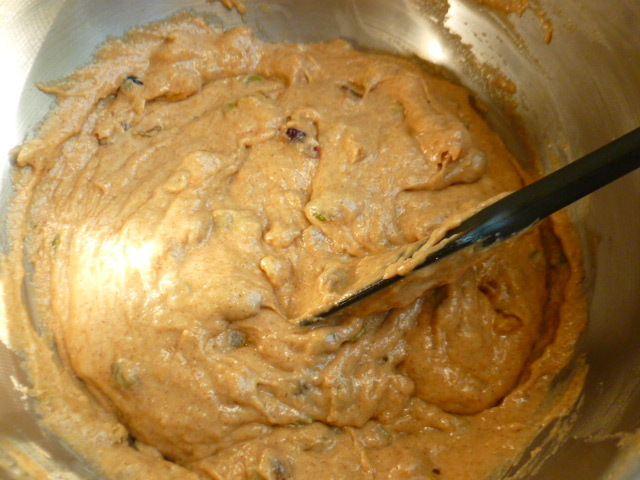 Add the spelt and white flour, baking powder, salt, vanilla and apple pie spice, and mix to a smooth batter. 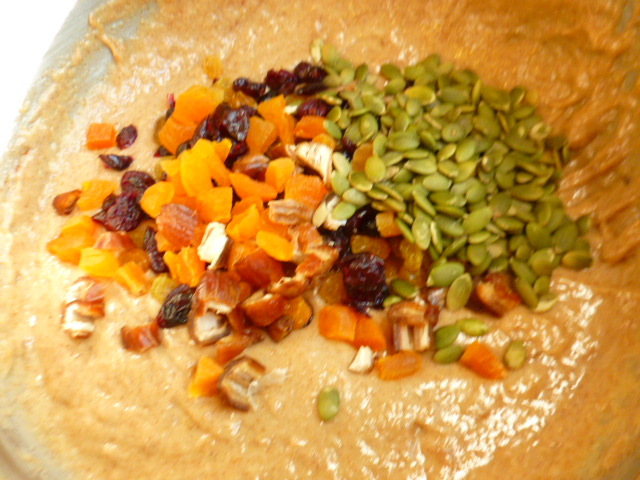 Add the dried fruits and pumpkin seeds and mix briefly, with a spatula, to incorporate. 4. Divide the batter between the paper cups and sprinkle the Demerara sugar on top. 5. Bake for 30 minutes, until the muffins are puffed and when a toothpick inserted into the center comes out clean. Transfer to a rack, to cool to room temperature, before serving or freezing. Yum, nothing like a muffin with all those goodness, they look fab! It is a great time of year for muffins! For us it is bitter cold and snowy! 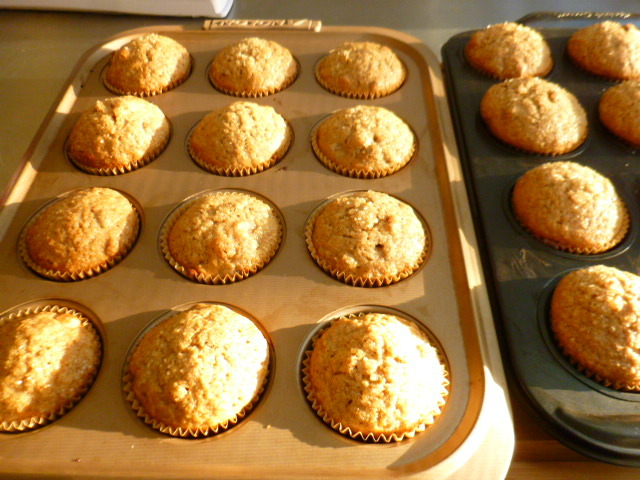 Great muffins, Ronit, especially since they are made with spelt flour. Thank you Dolly, I’m glad you liked the recipe. I used a combination of white flour and spelt, but it can be spelt only. Definitely going to try them! They look great! We love banana muffins, dried fruit and spelt bread, so your banana and dried fruit muffins look perfect. I haven’t seen vanilla paste here, but we have vanilla extract so I’ll give it a try with the muffins. These look delicious, Ronit. I can’t pass up anything with dried apricots in it! These look very appetizing to me, and I’m not a huge muffin or scone fan. I love the ingredient list. I need to find vanilla paste. I do use powdered vanilla, when I don’t want the vanilla extract liquid. I wish I too was not a huge fan of muffins and scones, but as I am, I’m trying to bake ones with less sugar and with healthier ingredients. 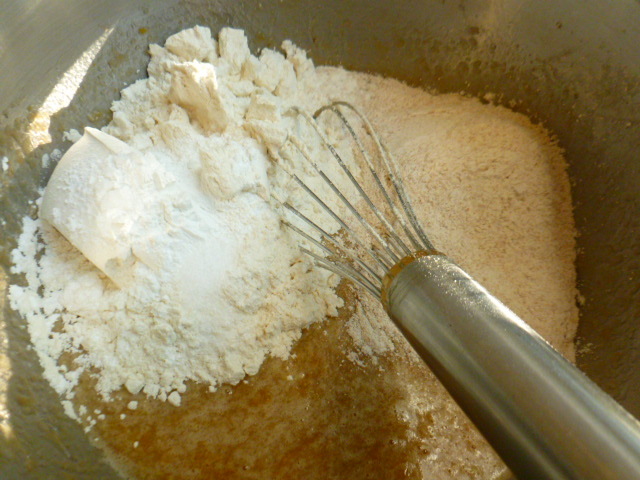 As for the vanilla, bit of extra liquid from extract will not make a difference in the batter. I’ve never used vanilla powder, but will check it out. Love Banana, with added dryfruits.. I am in…! These looks scrumptious! 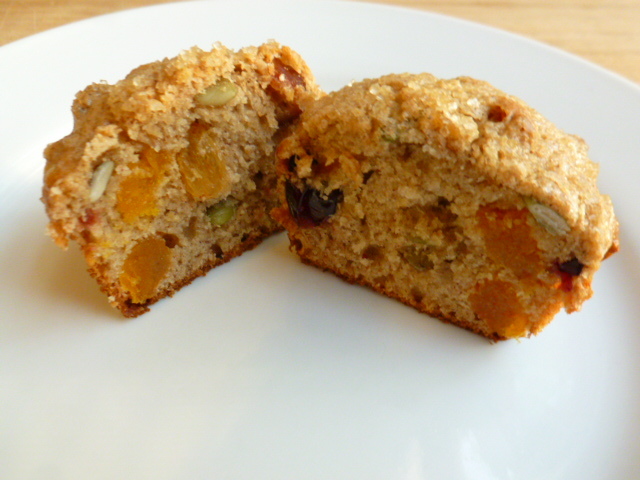 Love these spongy muffins with nutty & fruity flavors.